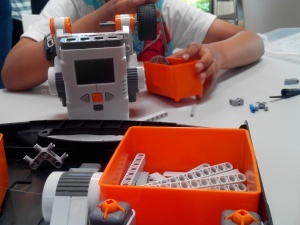 We offer workshops during which everybody can take part in amazing Workshops on Robotics. Using creativity and imagination children will construct working machines. What is a Day with Robo? It is a whole day event for children during which everybody take part in 60-90 minutes Workshops on Robotics. During such an event participants learn basics of robotics and construction. We teach them about different parts used during construction. After building children can test their creations in reality. Robots can do different tasks, taking part in funny competitions. 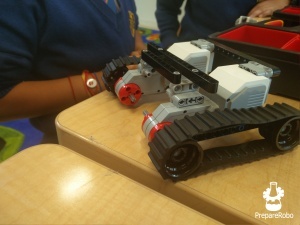 We use high end equipment – we work on the best quality LEGO® MINDSTORMS® sets. At the beginning of each session children are explained what they can find in the set, they are taught about all the major components which will be used to create the final robot. Children design and construct them in an individual and original way. We work in groups of up to 30 children. They construct in small teams to help each other. Workshops last for 60-90 minutes. Do we use instructions or manuals? One of our biggest advantage is that we do not follow any step-by-step instructions or manuals. We stimulate children to use their creativity during construction, helping them if any issues occur. We follow only the general topic, the type of robot constructed (i.e. robot which will follow the line). We teach children how to invent and implement their own solutions. We have our own designed program, starting from the most simple robots and adding more and more complex elements to them. What the robots can do? Robots can maintain different tasks. We can program them in many different ways starting with the most simple algorithms like moving forward finishing on very complex like solving the Rubik’s cube. Do children program during the Day with Robo? Due to nature of activities we are not able to program robots during Day with Robo – constructions are programmed before. If you are interested in workshops including programming we suggest you to consider setting up an after school club in your school. What do we need to prepare for an event? We need classroom with tables and chairs. We will also need a power supply. Everything else will be provided by us.